MH370 speculation has become excessive recently. Metabunk is not a forum for creating theories by speculation. It's a forum for examining claims, and seeing if they hold up. Please respect this and keep threads on-topic. There are many other forums where speculation is welcome. Discussion in 'Flight MH370' started by derwoodii, Apr 28, 2014. CNN aviation expert Miles O'Brien said GeoResonance's claims are not supported by experts. "My blood is boiling," he told CNN's "New Day." "I've talked to the leading experts in satellite imaging capability at NASA, and they know of no technology that is capable of doing this. I am just horrified that a company would use this event to gain attention like this." He called on company officials to offer "a full explanation" for their assertion, which he said appeared to be based on "magic box" technology. I'm very dubious of this. They claim to analyze satellite images to find particular elements using demilitarized soviet technology. GeoResonance has exclusive access to demilitarised technology now owned by the Sevastopol National University of Nuclear Energy and Industry in Ukraine, Mr Kursa said. Under the agreement, GeoResonance will first process satellite imagery of the area to identify the presence of hydrocarbons - the components found in oil and gas - and follow it up with an on-site survey. 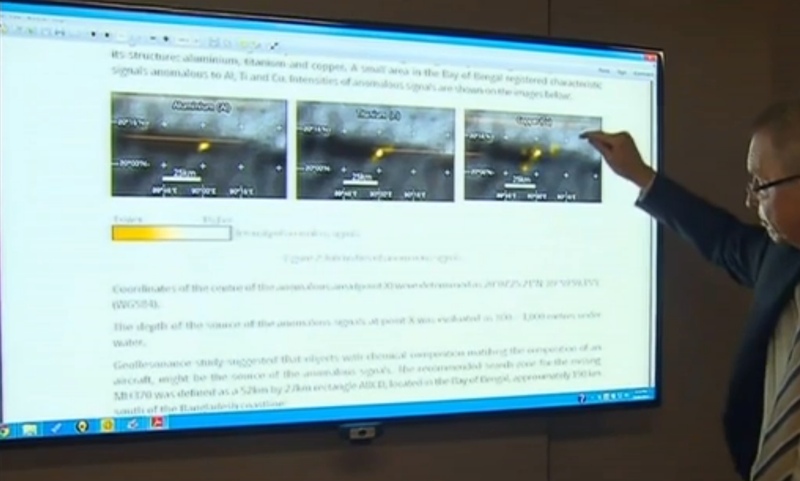 "Our remote sensing proprietory technology will help us process existing multispectral images and identify these deposits if they exist," Mr Kursa said. A key test between the partners will be if results from the initial remote sensing of one segment of the Cooper Basin tenement match up to data Mr Dorsch already has from previous work done on the site. "I think it's a good possibility of working. If it does, it will be another exploration tool in our war chest," Mr Dorsch said. GeoResonance will then use specialist equipment and sensors to send specific high-frequency signals to stimulate the potential deposit under the ground. The response or resonance will be relayed in real-time to analysts at the university to confirm and estimate its size. Findings will need to be confirmed by on-site drilling. Mr Kursa, who has been in and out of Australia since 1998, said he was not a scientist or physicist but had received military education and had specialised in radar technology in his now-home country Ukraine. Their web site is very sparse in detail. Military technology taken to the next level. We combine all techniques in one proprietary patented methodology. Some of our patents are: 86496-UA, 35122-UA, 2007A000247-EU. Locations of anomalous zones (if present) transposed on a 1:250,000 scale map. Area sizes of the identified anomalies. Fault lines, subsurface zones with increased fracturing. Direction of migration of subsurface fluids (oil or groundwater). Recommended sites for your drilling program. Our Remote Sensing reports are concise, brief and do not require interpretation. However there seems to be no real indication that the Armenia was ever actually found. The Black Sea keeps the most intimate secrets - both of ancient and modern times, says Serhiy Voronov, one of the leading specialists in underwater exploration, an official representative of Ukraine in the UNESCO International Convention on the Protection of Underwater Cultural Heritage, deputy chairman of the Union of Ukrainian Archeologists and director of the Crimean Republican Institution "Black Sea Underwater Research Center". In an exclusive interview with a UKRINFORM reporter, he told about the most intimate secrets of the Black Sea. A.: This will be our sixth expedition to search for the Armenia ship, which was sunk by German aviation Nov. 7, 1941. According to various estimates, on board the passenger/cargo ship there were 5,000 to 7,000 people, other figures say 10,000. Only eight passengers managed to escape. It remains to examine two small squares. 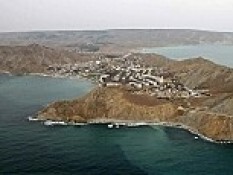 One of them is about in the abeam area at Swallow's Nest, the second - near Artek. We can see a very large dispersion and water area for examination. This is due to the fact that there are different coordinates of the ship wreckage. German pilots reported some coordinates, Soviet sources - other. Using different equipment, over five years we have virtually 'climbed round' all of the squares of the alleged wreckage of the ship. Two small squares have left, they were not available because the depth here is more than 1.5 kilometers. Which make the Georesonance claims look rather dubious. None of the stuff on their web site is verifiable, and the entire site looks rather unfinished and knocked together. When did they acquire their tech? The newspaper article is from 2013, so maybe they didn't have access to what they use now? Doesn't really matter, as they claim they found the ship on 2005, but it still has not been found. But they seem very new, and barely existing on the internet. Very suspicious. Anyone claiming to be based in "Sevastopol, Ukraine", probably won't be in business in that city for long these days!! Their hand-waving science looks like total BS to me. You can't get images like that from a commercial satellite of something that's several hundred meters underwater, and identify specific elements. Even if it is multi-spectral you can't see it, because it's underwater. Where satellite images are used for oil exploration, they can only look at the surface, and can only give a broad classification, not precise element analysis unless they get much closer and use hyperspectral rather than multispectral images. Remote oil exploration at sea relies on oil seepage - and detects oil slicks on the surface of the ocean. Look specifically at aluminum. If you could actually identify aluminum, then that's all you would need - the rest is irrelevant, as the plane is about 90% aluminum. Aluminum does not exist in nature in the metallic form. So why don't they show a wide area image with this "Aluminum Anomaly" on it. It should pop right out. Why not show some images of airports for comparison? You can't see aluminum by "process satellite multi-spectral images of the survey territory and identify areas that are anomalous to the targeted substance." because you can't see through the water. 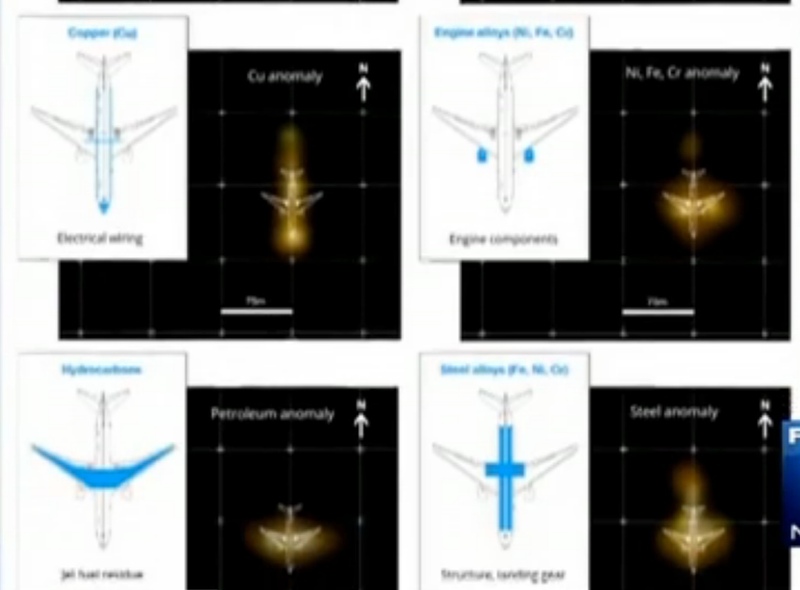 And they are not claiming to detect aluminum in the water itself, as they are presenting an outline of a plane. They are claiming to detect the actual aluminum in the plane. And why is the plane aligned exactly on a North/South line. It looks like they put the plane down, and then photoshopped in some glows. And why don't they give an actual location? Why not give the source image cubes they used? but their site talks about areas like 250km2 duration 7 weeks. and California is 410,000 km2. is that a misprint? the 2 million? GeoResonance Pty Ltd (“GeoResonance”), a South Australian company and its team of scientists have invested considerable resources into the search for Malaysian Airlines flight MH370. The only motivation is to help the families of the missing passengers and crew, knowing the company has the technology capable of the task. GeoResonance has discovered what they believe to be the wreckage of a commercial aircraft. 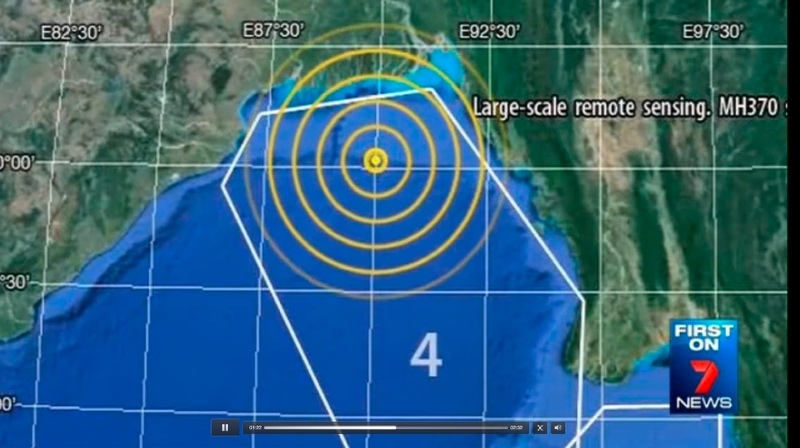 The wreckage is located approximately 190km south of Bangladesh in the Bay of Bengal. The wreckage is sitting on the seabed approximately 1000m to 1100m from the surface. The company is not declaring this is MH370, however it should be investigated. The search was completed using proven technology. In the past, it had been successfully applied to locate submersed structures, ships, munitions and aircraft. In some instances objects that were buried under layers of silt could not be identified by other means. At present the technology is being used with great success in the mining exploration industry. In order to identify and locate subsurface substances, GeoResonance Remote Sensing analyses super-weak electromagnetic fields captured by airborne multispectral images. 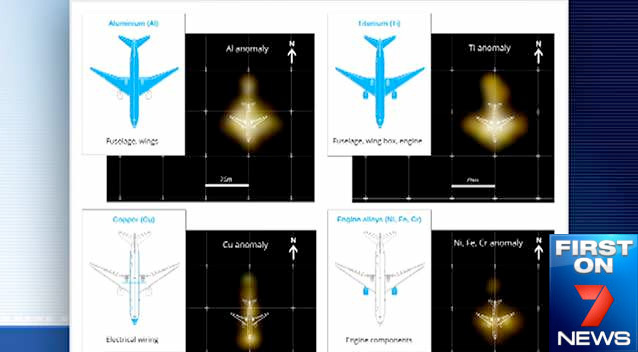 During the search for MH370, GeoResonance searched for chemical elements that make up a Boeing 777: aluminium, titanium, copper, steel alloys, jet fuel residue, and several other substances. The aim was to find a location where all those elements were present. GeoResonance commenced the search before the official Search and Rescue operation moved to the Southern Indian Ocean. The multi-discipline team of 23 researchers, including 5 professors and 12 PhDs got involved in the project. The search used the imagery taken on March 10, 2014, and was conducted consecutively in 4 zones north and northwest of Malaysia, until all targeted elements produced an anomaly in one place in the Bay of Bengal. GeoResonance completed analysis of multispectral imagery of the location taken on March 5, 2014. It established that the anomaly had appeared between the 5th and 10th of March 2014. The approximate location was passed onto Malaysian Airlines and the Malaysian and Chinese Embassies in Canberra, Australia, on March 31, 2014. It was well before the black box batteries had expired. These details were also passed onto the Australian authorities (JACC) in Perth on April 4, 2014. A more detailed study was completed in early April. The final 23 page report including the precise location of the wreckage was passed onto Malaysian Airlines, Malaysian High Commission in Canberra, Chinese Embassy in Canberra, and the Australian authorities (JACC) on April 15, 2014. The Company and its Directors are surprised by the lack of response from the various authorities. This may be due to a lack of understanding of the Company’s technological capabilities, or the JACC is extremely busy, or the belief that the current search in the Southern Indian Ocean is the only plausible location of the wreckage. The people involved in the Channel 7 Adelaide News interview were Mr Pavel Kursa, GeoResonance CEO, Mr David Pope GeoResonance Director and CEO of Tellus Resources Mr Carl Dorsch. Mr Dorsch was involved as a client reference for the technology. The company Directors are not seeking publicity, they only want to bring the results to the attention of the authorities. The Directors feel a moral obligation to help bring closure for the families of the 239 passengers and crew of flight MH370 by releasing the findings, so the authorities can investigate. This makes zero sense. The suggest that the plane has crashed, aligned perfectly north-south, with no significant fuel leakage, and yet they can detect the fuel in the fuel tanks, and the copper wiring, and the internal engine components, all through the skin of the plane. 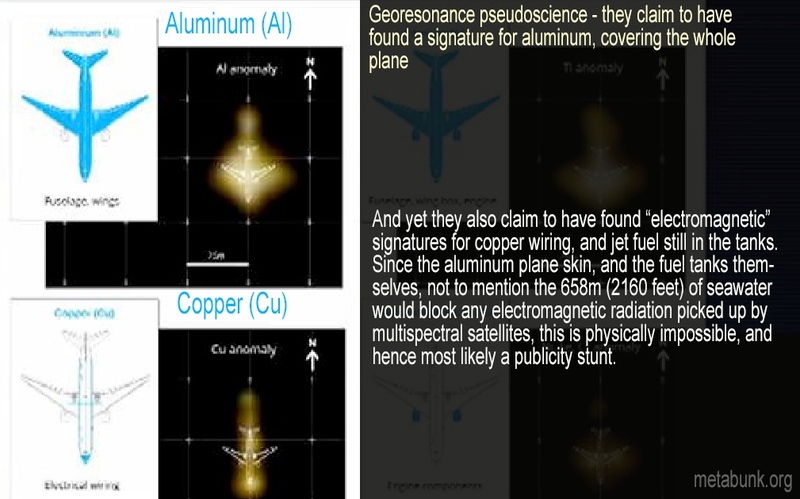 Again, they claim they have detected copper wiring (along the entire length of the plane) via multispectral images through 500m of water and the aluminum skin of the plane. Pseudoscientific babbling with big claims and no clear explanation of their supposed novel technology. Prospecting aids and rainmaking both have long histories of rather sketchy offerings. 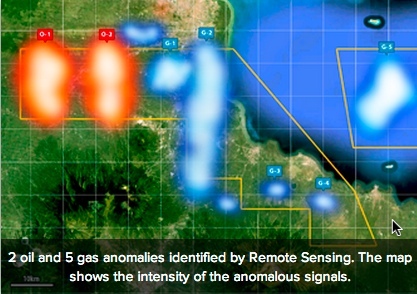 GeoResonance combines over 20 technologies and patented know-hows into one methodology. The application of so many technologies requires specific skill-sets and state-of-art equipment. Our typical project involves 47 scientists and nuclear physicists, including 5 professors and 12 PhDs. 20 un-named technologies, one un-named methodology, 47 un-named scientists, 5 un-named professors, and 12 un-named PhDs all from un-named institutions? True. Rainmaking, Dowsing, and Prospecting are practically sister hoax generators. They list patents: 86496-UA, 35122-UA, 2007A000247-EU. UA is Ukraine patents. EU is europe. The numbers do not show up anywhere on the internet besides here, and the Georesonance page. I was going to ask if anyone else had been able to locate those patents. When they say they use airborne multispectral images, does that mean they have a dedicated satellite taking these images? Or are they public domain images they applied their methods to? This reminds me of the pyramids found in Ukraine and which would form "a worldwide powernetwork of pyramids with its basis in nepal"
Now... This guy Vitaly A.Gokh also has a company that uses this "torsion technologies" (sic) to find gas/oil/water/minerals. I remember he found water in Mauretania, found water in Ukraine (therefore the pyramids) etc... He also used to have a more extensive site but now only found the link above. Now... 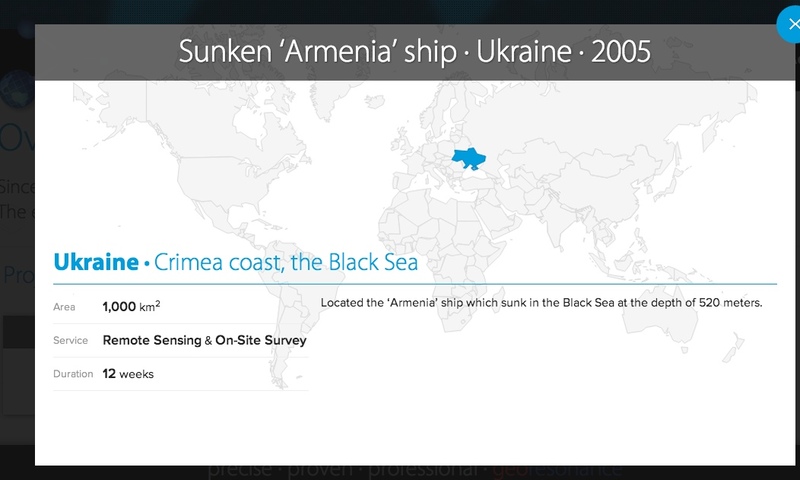 The list of achievements of the company GeoResonance : http://georesonance.com/georesonance-geophysical-survey-projects.html ALSO sums Ukraine, Mauretania, etc... so it sounds very equal. So... if this is the same guy he travels the world. I looked up the history of the company's website at archive.org (https://web.archive.org/web/20110128130011/http://georesonance.com/). Since 2011 the website promoted "holistic healing utilizing the vibrational qualities of various earth elements" [sic]. In 2013 it was then replaced with a placeholder page, and the current form of the website appeared only in April 2014, it means only after the MH370 disappearance. some verified 'control' pictures would be nice, as you said, how hard would it have been to show an airport? There is nothing to inspire confidence that this is anything more than dowsing with a lot of technical jargon. After a lot of effort they got the publicity they were seeking. The only question I have at this point is if they have located anything - could there be an oil-platform out there? Excellent research everyone. Hard to believe this got so much traction in the press. The website info posted by txt29 is particularly damning. I'm not sure that is correct, as the last "Holistic Healing" page capture is Jan 28, 2011, but the registration change is September 12 2011. Yes, that's right. Unfortunately the more complete historical DNS registry records are available only with paid services, so I cannot verify the older records unless I want to invest the money into it (what I definitely do not want). On the other hand there is no recorded change of the content till June 2013, so unless Archive.org did not check the website during two years (unlikely), the content was still the same (with the holistic healing info) even with the owner recorded in September 2011. Additionally, even if the holistic website was not made by the current domain owner (Pavel Kursa), the current content was only created recently (most likely after the MH370 disappearance). In January 2014, the website still contained only a placeholder page, and Archive.org shows the current content only as of April 2014. So it looks highly improbable that a newly created company with no track, no history, and no references could own such advanced technology that is unknown to anyone. 1. If you are interested in getting a better idea as to Georesonance's 'fuzzy' technology, google Bioresonance Treatment. I thought of BT on the first occasion of reading of Georesonance's claims. BT is quite in popularity in holistic/naturpath circles, and it claims to use similar technology in detecting subtle magnetic fields. Txt29 is barking up the right tree: there be a motive to be found somewhere in their application of the technology in different domains. 2. I am unsure whether there was any real assertion by Georesonance that the aircraft landed exactly on a N-S axis. I believe those cartoonish charts are merely for TV consumption, given that watching TV requires less cognitive activity than eating. Give 'em a break, Mike! 3. If you examine the screenshot labeled in this thread as 'Pic for latest Australia news' you can see that the anomalies are not all that discrete in terms of their orientation; they don't indicate a location on a N-S axis. I can also that the coordinates for the location are included, but can't discern them in the screenshot. 4. No listed clients, no extensive biographies, no technical explanations, no past press interviews, a garbled, non-technical press release...it all looks very bad in terms of establishing credentials. Perhaps Georesonance's PR manager moonlights for the Malaysian government, thus the commonality of gross incompetence. Please email me if anyone figures out where this company came from and what the heck they are up to. It reminds me vaguely of cold fusion. This reminds me of the basic Google Earth Hunters rally cry: "Look I found an alien on Mars," Or "Look a secret base on the Moon!" If they purposely created a dubious company to make the claim seem more reliable, this is a shocking development in the Google Earth Hunting CT Group. Usually they are not as advanced as the Naturopath crusaders and are indeed laughed at by the majority of the CT community itself. The quacks that sell New Agey drugs and supplements currently have tons and tons of websites complete with highly graded Better Business Bureau companies. So if this trend continues it will make finding real news even that much harder... Hopefully this was just a mistake and poor research from the news agency that picked this up/supplied the story. But something feels very calculated about this whole story. Some news outlets are still taking GeoResonance's claims at face value. This CS Monitor post makes no effort to find out if GeoResonance is a credible source. CNN ran an article this morning saying that searchers dispute GeoResonance claims. But the article only stated that GeoResonance was too far outside the search area. The reasons for the skepticism are obvious -- the site where GeoResonance says it found the wreckage, in the Bay of Bengal, is several thousand miles away from the current search area in the southern Indian Ocean. The Joint Agency Coordination Centre, which is coordinating the multinational search, dismissed the claim. "The Australian-led search is relying on information from satellite and other data to determine the missing aircraft's location," the JACC said. 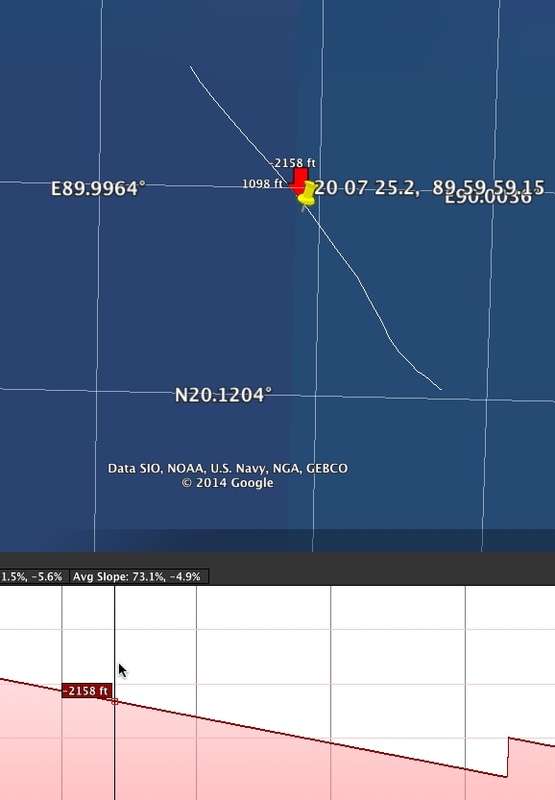 The location specified by the GeoResonance report is not within the search arc derived from this data. The joint international team is satisfied that the final resting place of the missing aircraft is in the southerly portion of the search arc." There's nothing vetting GeoResonance. There's just a list of repeating un-supported claims by GeoResonance. The company's director, David Pope, said he did not want to go public with the information at first, but his information was disregarded. "We're a large group of scientists, and we were being ignored, and we thought we had a moral obligation to get our findings to the authorities," he told CNN's "New Day" on Tuesday. GeoResonance's technology was created to search for nuclear, biological and chemical weaponry under the ocean or beneath the earth in bunkers, Pope said. Nothing in the article questions whether the company actually has the technology it claims. This next post by CNN was yesterday at 5:50pm EDT. GeoResonance specializes in geophysical surveys. The company's technology has been used to find oil and gas, groundwater, uranium, even diamonds. The technology the company uses was originally created to search for nuclear, biological and chemical weaponry under the ocean or beneath the earth in bunkers, said David Pope, the company's director. "Subsurface exploration has never been so precise -- we detect the nuclei of targeted substances," the company says on its website. In addition to finding natural resources, the company has also used its resources to located submerged structures, including ships and aircraft. What technology is the company using? According to an Australian newspaper account, GeoResonance makes use of former Soviet defense technology that has since been demilitarized. What Soviet technology would that be CNN? How about the stuff that GeoResonance claims to have found in the past? You think you (CNN) might want to ask to see some examples before you take GeoResonance's claims at face value and present them in a news story? I'm considering this to be an epic fail by CNN. The story, the company's claim to be able to use magnetic resonance imaging, presumably somehow projected from a satellite (formerly secret Soviet military technology only they have access to) as well as nineteen other undisclosed technologies (doubtless including a TriCorder and talking computer that says, "Working...") analyzed by a "team" of unnamed scientists to detect copper wiring, fuel inside wing tanks or ceramic engine components 600' underwater from space with resolutionas good or better than the optical resolution of geo-survey satellites is so absurd that I cannot stop the belly laughing. Anybody who is knowledgeable of the technology knows it took decades of development and magnetic field strengths of 1T along with kilowatts of induced gradient and RF fields at a distance of a foot or so just to be able to align the spin axis of hydrogen atoms and get the millimeter resolution to peer into your body with an MRI scanner, so achieving an equivalent order of magnitude or two better resolution from space with a secret satellite is a joke and a half. One other thing... the 777 as most modern airliners, uses as little copper as possible in wiring, larger conductors often being aluminum or copper-clad aluminum, as well as extensive use of fiber optics... oh, why waste my time, it's a bunch of crap. As with most of these types of operators, their claims of past applications or success are far flung in remote places about the globe (Congo, etc) and impossible to validate, the few identifiable "customers" such as Mr. Pope always seeming to be partners in their adventures. Just a couple scammers, most likely pushing a Pink Sheet stock and trying to cash in on the misery of others. Use: remotely prospecting mineral resource deposits. Essence: the system for remotely prospecting mineral resource deposits comprises a carrier-signal master oscillator, a receiver recorder and antennae. The carrier-signal master oscillator is in the form of a semi-conductive laser in the red frequency range, which is mounted in a body. The system additionally comprises a test plate containing a log of characteristic electromagnetic oscillations of the mineral resource sought, an amplitude-frequency-phase modulator intended for generating a signal modulated by a signal from the test plate, which signal corresponds to the characteristic oscillations of the mineral resource sought, with the possibility of exciting nuclear magnetic resonance in the mineral resource sought and of the latter emitting a re-emitted signal. The test plate is connected to the input of the amplitude-frequency-phase modulator, the output of which is connected to the input of the carrier-signal master oscillator, which is provided with a corresponding antenna, and the receiver recorder is provided with a corresponding antenna for receiving and recording the re-emitted signal from the mineral resource sought at "Larmor" frequencies of said signal. The technical result: highly accurate results produced when prospecting mineral resources without the use of aircraft. 1. Remote reconnaissance system mineral deposits comprising an oscillator carrier signal receiving recording device, and an antenna, wherein the master oscillator carrier signal is in the form of a red semiconductor laser of the frequency band set in the housing, and the system further comprises a test plate with a record of the natural electromagnetic oscillations of the desired mineral, amplitude-frequency phase modulator for generating a signal modulated signal with a test plate, which corresponds to the natural oscillations of the desired mineral with the ability to drive in it nuclear magnetic resonance and radiation re-emitted minerals desired signal, This test plate is connected to the input of the amplitude-frequency and phase modulator whose output is connected to the input of the master carrier signal generator provided with a respective antenna and the receiver corresponding to a recording device provided with an antenna for reception of the desired signal reemitted at its mineral "Larmor" frequencies. 2. Remote reconnaissance system mineral deposits according to claim 1, characterized in that the test plate is made of a polymeric material with preprinted information layer mixtures of polysaccharides and organometallic additives thickness of 0.05 - 0.10 mm, in which electromagnetic oscillations are recorded own desired fossil. perpendicular to each other and tightly pressed against the surfaces of the different test plate via an insulating film inductor clad on the body of the master oscillator of the carrier signal, and each end of the coil is connected to one of the metal meshes. Basically a fancy dowsing device. Scientific nonsense. I have had occassion to examine a similar technology and was impressed with what it was able to locate and is not a magic wand or a dowsing rod. Bearing in mind Georesonance has released their multi tiered synthesis of the various compound materials they located that are infact apart of a 777 airliner I humbly suggest you not put your credibility in irreversible checkmate by attacking Georesonance untill after the unknown object has been examined by an underwater drone to get a visual on the object. Also bearing in mind entire purpose of Metabunk is to refute claims in regards to evidence, may I remind you that not one shrep of evidence has been released by the official investigators yet you beleive that the aircraft is in the Indian Ocean. I am calling you out on your own self contradiction. Please explain why you are not refuting the totally unsubstantiated claim that the missing aircraft is in the Indian Ocean in spite of zero evidence to support that claim? That's not the topic. The topic here is the dubious nature of the Georesonance claims. If you have some experience with this "technology", then please share it, with references. Specifically how it would detect the copper that is inside the plane, through 600m of seawater, and the plane's walls. "Copper occurs both naturally and anthropogenically. There is no difference in the two forms. Copper is ubiquitous in the environment with 50 ppm in the Earth’s crust and 0.25 ppb in Ocean water to over 100 ppm in sediments." I also note that as a holder of eight awarded patents I can assure you that mechanisms and processes described in preferred embodiments need not be proved to actually work. That is not the topic you say..?? You have now completely self defeated the entire essence and purpose of your paranoid website. May I remind you by your own words you articulate that you are all about debunking dubious claims and yet you continue to defend one of the most bizarre and sensationally ridiculous claims in recent history.?? "Before, he had refined the system so that specific type of photography could occur from the air, thus able to cover larger areas; he also adapted the system for the search of oil, gas and precious metals, finding a willing partner in the oil company Chernomornefte-gaz." This describes the usage of the technology pre 1999 to find water in Mauretenia and finding water and accidently pyramids in 1999 (still not confirmed but lets be polite and assume that is true). On the site of that person Gokh, you will then see explanations (wild!) of that technology , customers like oil companies and consultancy. Until mid April 2014 this website was on gokh.ru but it has dissapeared and also not traceable on internetarchive. (2 weeks ago the website was live with many pics). On it you could find usages of the technology to pinpoint minerals on planets in our solartsystem just by using the tools on photographs of the planets. The problem is that I have not found a link between Dr. Gokh, Dr. Mukhudin and Dr. Taran (1999) and georesonance (2014) which uses the same kind of stuff from russia. I don't really understand what you're talking about, but the "Sevastopol national university of nuclear energy and industry" is a recurring name. it seems to me the university holds the patent to georeasonance technology. and georesonance is just licensing. (I could be wrong). but this link here says gokh has his own unique patent. GeoResonance claims to use a nuclear reactor and Kirlian photography to convert ordinary satellite or aerial images into mineral maps. The same Kirlian photography used to record the supposed ‘life force’ aura in parapsychology experiments in the ‘70s. They claim 100% effectiveness. It’s total woo with enough pseudo-science bafflegab to impress the rubes looking for uranium or oil in their farm fields. Their “technology’ patents trace back to a shady Ukrainian Geophysical group (transcomplex.uk.com) who claims that photographic images contain a broad spectrum of frequencies outside of visible light, all the way up to the terahertz band, and some of those frequencies correspond to the magnetic resonance frequencies for various minerals. They even suggest this works for digital satellite images, which aren’t even recorded on film. They make a negative film from an aerial image of the area they want to survey, wafer it against a thin-film of the mineral they are searching for and a plate of X-ray film, then they expose the stack to radiation in a nuclear reactor. Their theory seems to be that gamma and alpha radiation passes through the negative and somehow stimulates the film to release its broad electromagnetic spectrum, which is filtered by the test layer and somehow only the frequencies that match the nuclear magnetic resonant frequency of the mineral passes through and is recorded on the X-ray film. Then they treat the X-ray film using a high voltage Kirlian field, and viola, a magic image showing the pattern of that mineral under the ground. Film and digital images do not contain multi-spectral layers, they are just RGB amplitude values of the total energy in whatever spectrum band the camera is sensitive to, it cannot be separated out into individual wavelength contributions later on. This is just dowsing with a high-tech sounding wrapper. The "scientists" listed in the patents have no credentials or papers to their name that I can find. The company's listed projects don't seem to lead to anything. I'm sure their process goes nowhere near a reactor, they just take some Google Earth image and airbrush a mineral map (or airplane outline) on it. They also have a field work process where they can supposedly map minerals in 3D by exciting a mineral sample with a laser to generate some kind of UHF signal which they aim into the ground, then they do a raster type walk-around with a receiver to map the resonant responses of the minerals underground. I'm sure they charge more than a few bucks for this service.